Spokane, Wash. - Move over, Russell Wilson -- there's a new Northwest League alum ready to make his mark on the National Football League. 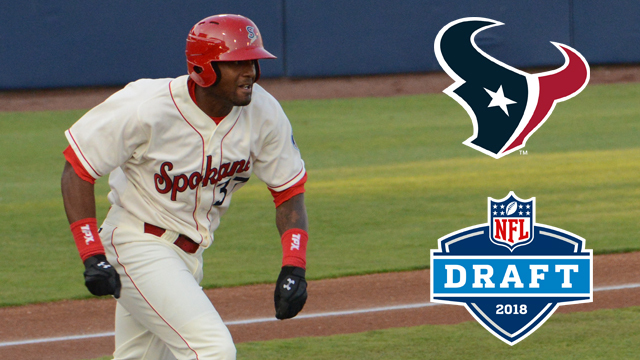 Jordan Akins, who appeared in 22 games with the Spokane Indians in 2013, was selected in the third round - 98th overall - by the Houston Texans in the 2018 NFL Draft. A third-round pick by the Texas Rangers in 2010 (one spot ahead of Marlins catcher JT Realmuto) Akins retired from baseball following the 2013 season and enrolled at the University of Central Florida, where he was originally part of their 2010 recruiting class. The 6-foot-3, 249 lbs. Akins spent time as a kick returner and wide receiver with the Knights before settling in as the team's primary tight end. He played an intergral role in UCF's undefeated 2017 championship* season, finishing with 32 catches for 515 yards and four touchdowns, including a pair of highlight-reel grabs in the Knights' win over Auburn in the Peach Bowl. "To get drafted in [Major League Baseball] and then to go back to school at UCF and dream about getting drafted by the NFL is just a dream, man," Akins told the Orlando Sentinel. "To get drafted in the third round in baseball and now the third round by the NFL. It's great. It's a blessing." The Texans envision Akins as a key downfield valuable weapon for second-year quarterback DeShaun Watson, with Akins' size and speed creating matchup nightmares for opposing defenses. "Jordan's a guy that came across very well as a person, and then as a player on the field," said Texans head coach Bill O'Brien said. "He has a good work ethic. Good ability in the passing game. We were excited to be able to have a chance to draft him." Akins isn't the only former Spokane Indians player finding success on the gridiron. Jamie Jarmon, who was teammates with Akins in 2013, enjoyed a strong senior season with the University of Delaware Blue Hens, leading the team in receptions and scoring eight total touchdowns. Originally drafted 15th overall by the Rangers in 2010, Jake Skole retired from baseball in 2016 was recruited by the Univerity of Georgia, Georgia Tech and Florida State University before signing with the Bulldogs. Skole was a three-star football prospect out of high school and will look for his first game action with the Bulldogs in 2018 after serving as a pratice squad player in 2017. Akins will be the third NWL alum to play in the NFL, following former Tri-City Dust Devils players Russell Wilson (2010) and Vernand Morency (2001). The Indians are the Short Season Class "A" affiliate for the Texas Rangers. Ticket packages for the 2018 season are now available for purchase. CLICK HERE to reserve your seats today. For more information, please visit spokaneindians.com or call (509) 343-6886.